Behind the Things You See | We've got our fingers on the trigger, and we're not afraid to push! So, long time no see, again. Yes, yes, I know. I fail at this writing thing. It’s not so much the writing as it is the keeping to a posting schedule instead of visiting wordpress and getting lost in other blogs. It’s the same thing on Tumblr, Twitter, Instagram and FB for me. No it’s not ADHD…. it’s more like easily distracted, believe me I am not hyper about anything… well except chocolate and new camera gear, and maybe cute puppies. Anyway to the good stuff! On the list are two new photo sharing apps. One is very specific and unfortunately for me doesn’t have an android app yet. Just a mobile website, which is fine, just lacks some of what you would expect. But it is a relatively new app. Know as Pack, it is a photo app for dogs! Only dogs. I mean you could take a selfie, as long as it is with your dog. Visit the website or check out the app for ios here. It is a great way to share the love of your best friend and not feel guilty about spamming your social networks with photos of your dog. If there was an app for android I would use it more as the mobile website doesn’t quite offer everything I like in a photo app yet. On to my second, and I dare-say my Instagram replacement! Not that I really even use Instagram much, it is way, way to messy. EyeEm is my newest photo sharing app obsession! Oddly enough you can also connect it to your Instagram. You can also connect it to your Twitter, Tumblr, Flickr, Foursquare, and Facebook. I am still waiting for a G+ hookup, please please please give me a G+ hookup! EyeEm offers a nice selection of filters and all those other things you like about a photo sharing app but it does offer more, a lot more. First there are missions, much like how Foap had events you can join and win money or prizes so does EyeEm, however, I don’t need to take a picture of my passport or drivers license to compete. Secondly unlike other photo sharing apps like Instagram where the plethora of tags is staggering, I am limited to 4 tags. It is amazing! The limit of 4 tags helps a lot, and cuts down on the messiness. When I search for #Cute dog, I just get cute dogs, not random selfies tagged with cute dog. EyeEm also has two great features that deal with geo-location. The first is if you photo has geo-location information you can tag businesses, locations, etc directly, much how foursquare used to work. 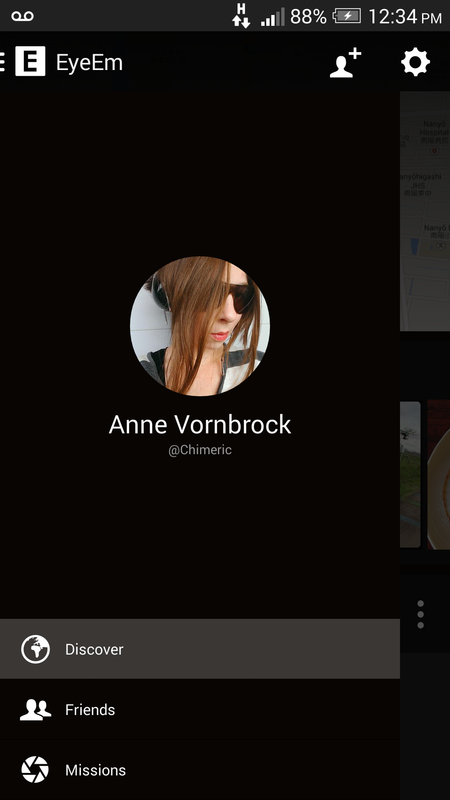 The second geo-location feature is like something from 500px but much better. Photos tagged with a geo-location close to where you are with your phone now show up. A great little feature called “Photos around you” will bring up any photos tagged with geo-location in the area you are currently in. It’s great for last min photo ideas, photo walks, and inspiration in a neighborhood you may no longer see anything new in. So if you have the desire to leave the little square box behind check out EyeEm. In photo trip news August should be a decent month. I plan on going to Yoro Park in Gifu and hopefully climbing Mt. Fuji this vacation! It will destroy a pair of shoes though… it did last time. So I will need to get a new pair. I am in need of a new pair of Vibrams anyway 😉 September is looking pretty bland but I am saving for the Kouyou season so I can hit Kyoto, Wakayama and Nagano this year! I am taking part in Color Me Rad in Tokyo on the 23rd of September but I have been reading the horror stories of the cornstarch in the lens! So now I am seeing what I can do to protect my camera and if it is worth the risk…. One can hope! It looks like it may involve a lot of plastic wrap, plastic bags and maybe some duck tape to keep it all sealed up tight. I did make it to the last day of the World Cosplay Summit which will be up in a post hopefully next week! So keep an eye out for those photos! It was amazing! I just wish I had taken the days off in advance and gone to the whole thing! Next year that is the plan! I also became an official contributor to Yokoso News! Check it it here!! Get your Japan fix from the Chubu area! That title most likely tells you absolutely nothing… Unless you googled it already. (On a side note, my post order got mixed up so scroll down to find my sakura plans~ They had already been posted before the last post. Fail on my part sorry! 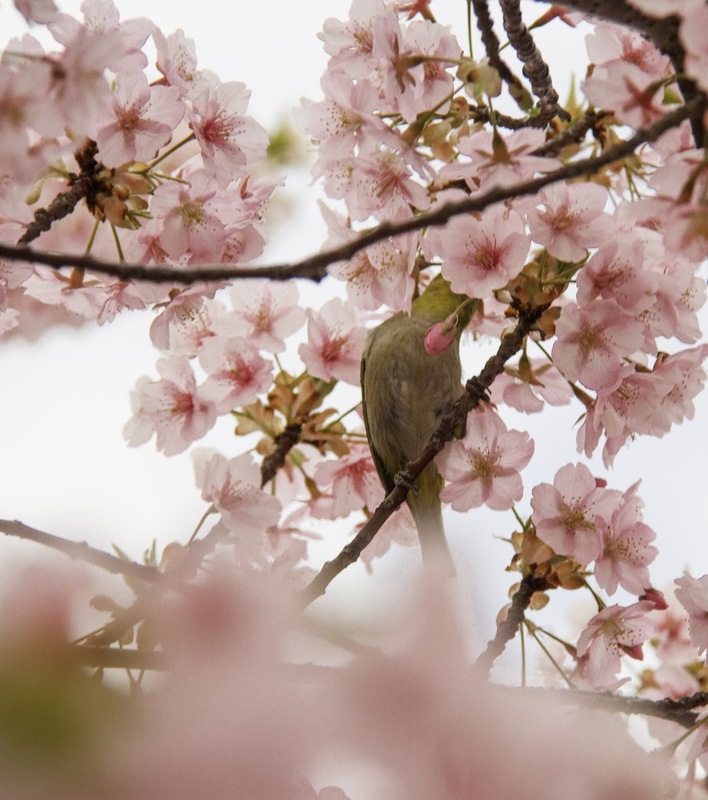 Anyway,) Mejiro are small green, with a dash of yellow, birds that have a white circle around their eyes. 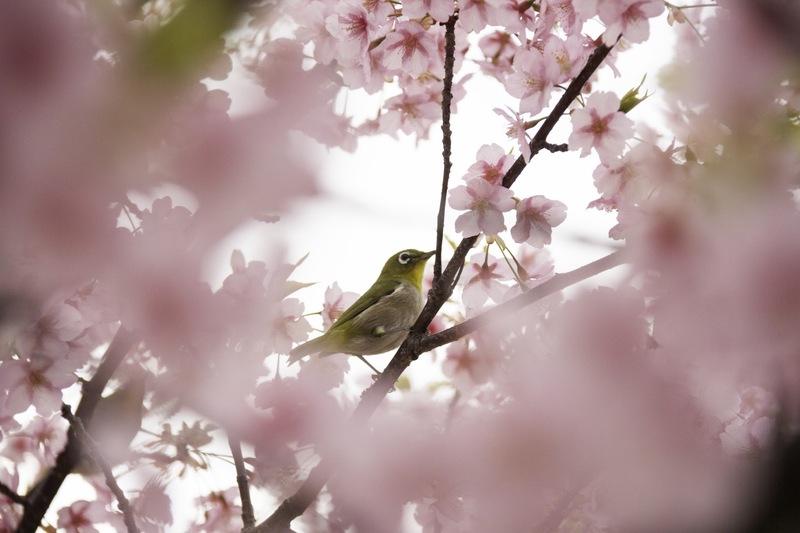 Also known as White-eyes or Japanese White Eyes they are omnivorous little birds. During sakura season they enjoy plucking the little bugs right out of the pink blossoms making for some interesting pictures. What they don’t tell you is that these little guys are fast! Always hopping around and quick to flit away~ Which makes getting in focus shots difficult! Especially if you forget to remove your filter….>.>…. I just published a post that I thought I had already published. Fail on my part. So now this is going to seem a little weird. Three maybe four posts right in a row! I have been bringing my camera with me more often. Not as often as I like, but more than usual. So I have been getting more shots and have also gotten a few new pieces of gear to go along with it. So I thought I would share the goodies first! I gave in after many mad reviews from my photog friends and got a Black Rapid strap! I can’t say I’m disappointed! Besides costing me a pretty penny….. 8000yen, rough equivalent is about 80$. Definitely worth it though. It saves on time and energy also my neck. I’m able to get the camera up faster and it doesn’t bounce as much as when I have it around my neck. Haven’t got to try it with the backpack yet but sakura season is almost here! I will let you know how it goes after that. Since Sakura Season is coming up I went ahead and got a diffuser! A nice big one! If I remember right it’s a 52″. This year I will be attempting to do some photos of my friends frolicing among the blossoms. So that is a challenge in and of itself but hopefully it will turn out okay. One of the reasons I got this is I watched RC Concepcion’s video on doing shoots in midday sun. You can watch the video here! Definitely worth ten minutes of your time. Now what I really wanted was one of these, but was unable to find one at Bic Camera. May have to order one soon. Finally I have had it for awhile but haven’t really gotten much play out of it yet. That should change here quickly. So last but not least I got a Canon 430 EXII. I have been goofing around with it and working on settings and that sort of thing. Though ttl is pretty easy to use and it doesn’t require me to do a lot of thinking, I would really like to get manual flash down. So more studying is necessary! 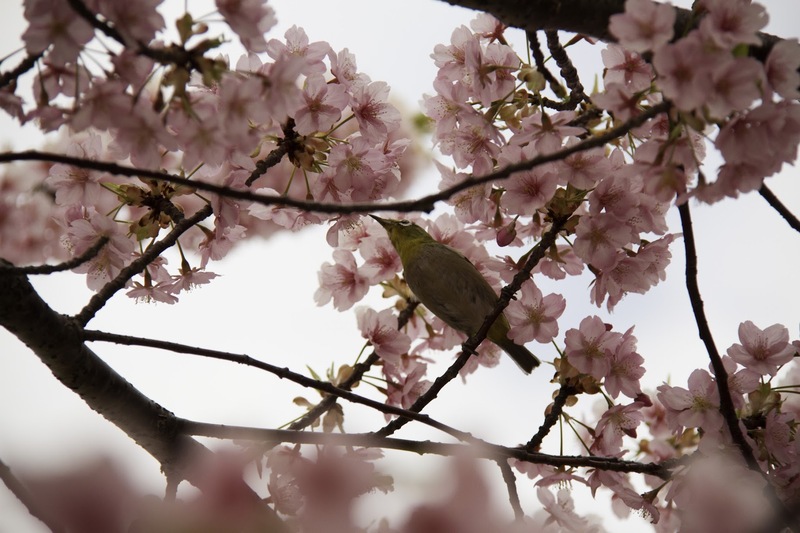 The previous post is SAKURA SEASON PLANS 2014!!! Let the frolicing commence! Bonbai? What is that you ask? Well it is a bonsai ume(plum) tree and I got one! I went to Nagahama to blow glass and also happened upon a bonsai exhibit. Now being American it is always interesting to see things that are, well, older than my country. I know that sounds weird but hang on a moment I shall explain. Japan, China and some parts of India have some of the longest, static, by static I mean continuous culture/tradition/history, which I find fascinating. Of course some things have changed but as a whole compared to the rest of the world there hasn’t been and huge revolutions to the heart of the culture and tradition. So when I saw these little trees that were 400 and some years old it made me stop and think. This art, this piece of culture has survived so much and has been passed down successfully that it makes one want to be part of it, to be a small piece in the bigger picture. So, I bought one and will attempt to not kill it! Its actually quite a bit of work once every 3 years or 5 years. The repotting process is daunting but I will attempt it this December. In the meantime I get to enjoy the lovely blossoms this year and will have to prune and water only until December. It also makes a great subject for photography~ So there shall be many more photo experiments to come that include this new little member of my family. My first experiment was with time lapse. I know, I don’t start small. So for my first ever time lapse I would have to consider it a success! It was actually much easier to do than I assumed it would be. As you know, I have a Canon 7D and thats pretty much all I really needed. I didnt have to purchase any special software. I used the EOS Utility and iMovie, as I have a Mac but I am pretty sure you could do it in just about any regular movie editor. Using the timer in EOS utility you just have to make sure your live view is off. Set your camera up on a steady tripod and fix the focus, DON’T use autofocus as it may search each time for a new focus point or be unable to find it. I ran my camera in Manual but you could also do this in AV, TV, P or B. Depending on the length of time you need between your shots or the length of your shots I have read you may have to have it in B, given that I was throwing mine together before work and have yet to attempt another one I am not sure if this is true or not. I set mine to take a photo every 30 seconds and just let it go. I had originally had it set to take 500 photos but it only took 372 as the light and my camera both died. I highly recommend starting with a fully charged battery! Mine was down to the last little bar when I started, fail on my part. I stuck around for the first ten or so actuations and then left for work. Came home and threw all of the photos into one folder and then imported them into iMovie. Set the display time to 0.1 seconds and fixed the crop so I didn’t have that goofy, ahem, I mean supposed cinematic effect. All in all 372 photos became about 50 seconds of movie. So not overly long but considering I didn’t do a lot of work on my own not bad. Now I did take all of these photos in RAW so I could go in and batch edit or fix a few if it seemed necessary, however, as this was my first attempt I was more worried about it actually working rather than the quality of the images. Bad, bad, bad Anne! I know, but now that I have this part down on my next one I can work more with the quality of the images. My biggest worry was to do a lot of intensive work and then have it fail somewhere along the way. Now that i know the first few steps I feel more comfortable putting more work into the next one. I would like to try a night time lapse but we will see how it goes. I would need to get out of the city and into the countryside to actually be able to see the night sky. But when i get this down I have a new reason to climb Mt. Fuji this year, because there is this great little spot near the top that I think would look great in a time lapse with the stars.